When in homes, most dogs are able to enjoy cuddling, playing, sniffing, eating treats, going for walks, visiting with people and dogs, and learning new things. Although all shelters must provide dogs with food, water, and shelter, it is also important to provide them with social interaction, mental stimulation, and the exercise that they need. The enrichment programs described in this section will help shelters fulfill these basic needs. To keep track of daily interactions with each dog, see our Canine Enrichment Chronicle [PDF]. Remember, not all dogs are the same, and each one will prefer to do different activities. Structured programs for shelter staff and volunteers provide people with guidance with regard to how to train and enrich the lives of shelter dogs. 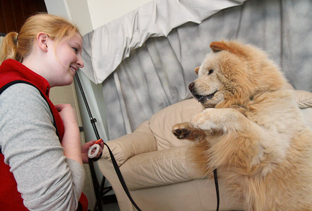 Canine Life and Social Skills, C.L.A.S.S., was created by the Association of Pet Dog Trainers. The C.L.A.S.S. program enables staff and volunteers to follow detailed training plans and guidelines which teach dogs life skills which may improve their ability to integrate successfully into a home. Dogs who complete the six C.L.A.S.S. lesson plans are eligible for a bachelor’s degree in C.L.A.S.S. To learn more, check out the C.L.A.S.S website here! Training shelter dogs potentially increases their adoptability by teaching them behaviors that make them more desirable to adopters. Learn more about training and motivation programs. Providing dogs with physical and mental stimulation is a critical factor for maintaining their behavioral health. These enrichment activities will keep dogs busy, so they are less likely to do things we DON’T want them to do. Learn more about dog entertainment.